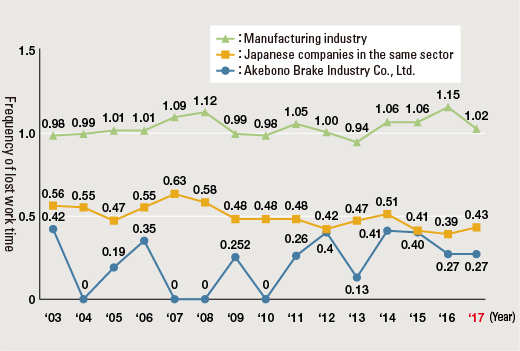 Occupational Safety and Health | With Our Associates and Their Families | Stakeholders | Corporate Social Responsibility (CSR) | Akebono Brake Industry Co., Ltd. In order to improve our global safety and health management capabilities, we hold regular global safety workshops at all of our production locations throughout the world. 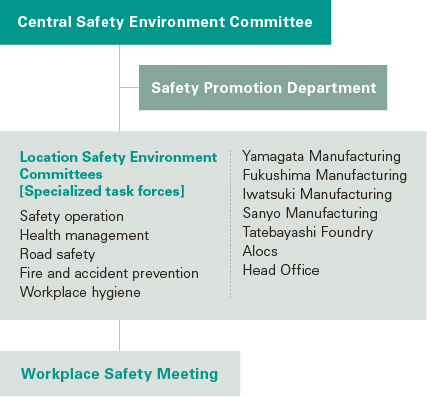 In Japan, Akebono has established a management system centered on the Central Safety Environment Committee. Through this system, we strive to ensure the safety and health of associates with the aim of identifying and reducing various risks related to our operations, including prevention of disasters, accidents and other emergencies. Placing the utmost emphasis on securing the safety of our personnel, we have set rules that allow no newly recruited associate or contract worker to engage in actual operations unless they have undergone the required safety education beforehand. We also distribute a booklet summarizing important safety issues to all associates to raise their safety awareness, as well as provide regular opportunities to learn about safety starting from fundamentals. 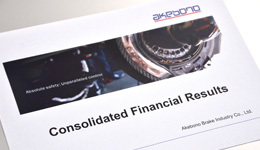 Akebono maintains a disaster prevention system based on our business plans. We also established business plans, mainly through the BCM Promotion Office, to ensure production continuity at the time of earthquakes and other natural disasters. 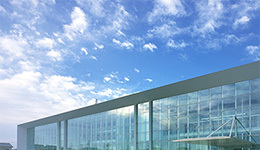 With the building being equipped with seismic isolation devices and power generators that can provide electricity for 72 hours, and the boardroom having a fire suppression control panel and emergency broadcast microphone installed, the head office can function as an emergency control center in case of a disaster. At Akebono, each department holds a daily morning meeting which includes reading aloud from Safety Knowledge. These simple routines help to keep everyone aware of safety issues in their immediate environments. 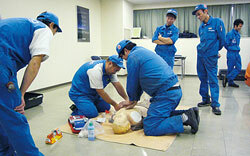 At Akebono we regularly carry out emergency drills and first aid training. To minimize the damage in a time of disaster, we hold fire drills as well as evacuation drills assuming the usage of the earthquake early warning system provided by the Japan Meteorological Agency. We also conduct demonstrations using earthquake simulation vehicles and smoke generators to let associates experience conditions in emergency situations. In addition, under the supervision of the fire department, associates take part in resuscitation training and learn how to use AED (Automatic External Defibrillator) devices. 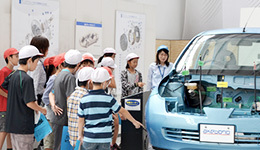 As a corporation providing safety to society, Akebono organizes driving safety seminars for our associates to help them avoid traffic accidents. The company aims to improve safety awareness and conducts ongoing education on driving skills to prevent accidents. This includes topics such as safe and smooth driving and maintaining correct distance from other vehicles - both practiced on the test track with support from local driver training facilities and guidance from the police. Associates can also experience driving while wearing goggles that simulate the effects of drinking alcohol. The figure above represents data submitted based on the calculation methods for accidents causing lost work time adopted by the health and safety agencies of each country. Figures for 2017 do not contain U.S. national average data as such data had not been publicly disclosed as of June 2018. 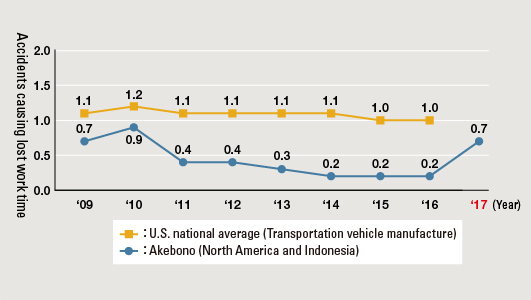 Data for Akebono from 2008 to 2009 included ABG and ABE; ABCS and ABCT were added from 2010. AAIJ (Indonesia) was included from 2011. Well ahead of other Japanese domestic companies, Akebono began the development of asbestos-free products in the 1970s. Not only did we lead the field in completing the transition to asbestos-free OEM products for new cars by 1992 and commercial vehicles by 1994, we have not manufactured service parts containing asbestos since 2000. We provide health consultations relating to asbestos and have implemented complementary health checks for neighbors who have lived near Akebono plants, ex-associates, and their family members. In total, 629 people have undergone asbestos health checks as of March 31, 2018. We plan to continue these checks in the future. Regarding the lawsuit filed by former associates and bereaved families on November 28, 2012 seeking compensation for asbestos related health damages, a settlement was reached on December 25, 2015. 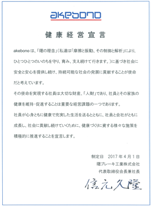 In fiscal 2017, Akebono created the Health Management Declaration, which expresses the Company’s commitment to proactively advancing measures that promote good health as a part of giving back to society. This declaration allows the company to grow along with its associates while helping associates live healthy fulfilling lives in both mind and body. ・Create healthy and fulfilling lives for associates in both body and mind and aim to improve productivity and creativity by raising health awareness among associates and improving the work environment. The conventional goal-oriented exercise promotion program, “Kenko Akebono 21,” which is geared toward promoting both physical and mental health and improving health awareness has been reformed, systematized, and reestablished as “Akebono Wellness Points.” Under the “Akebono Wellness Points” system associates are awarded with prizes based on the points they earn for their number of daily steps, the number of times they participate in health activities, and the results of their regular physical checkups. As a company we participate in the “Saitama co-baton health mileage” walking promotion program offered by Saitama prefecture as one of our health promotion measures. The program encourages health through competing for the highest number of steps per day among work colleagues and friends. In addition to exercise, as an initiative geared toward raising health awareness, associates can participate in health lectures by outside instructors and donate blood, which is part of our CSR activities, to receive points. The implemented system then offers health-related prizes in exchange for points earned. To further the maintenance and promotion of both physical and mental health management for our associates, we continue to have the dedicated Ai-City occupational physician act as our general occupational physician. 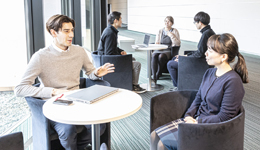 In addition, in July we held a stress check for all of our associates at locations within Japan based on the revised Industrial Safety and Health Act. Interviews or consultations with an occupational physician were offered to those who were diagnosed with high stress levels, and a briefing session was held for line managers regarding the results of the diagnosis. 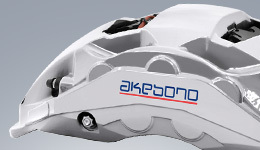 On February 20, 2018 the health promotion activities of our entire company, including all of the associates and managers in the Akebono Brake Group, came to fruition when we were recognized as a White 500 company, certifying outstanding health and productivity management. This is an award honoring large-scale corporations practicing excellent health management, and is jointly promoted by the Ministry of Economy, Trade and Industry and the Nippon Kenko Kaigi. We will continue to maintain our health management programs, and pursue fulfilling lives for all Akebono Group associates by creating an environment where employees can continue to grow in good health both physically and mentally. After verifying the effects of the three pillars and eight initiative themes of the Health Management Promotion enacted in 2017, we will continue to carry out the PDCA cycle and make continuous improvements while striving to achieve an understanding of the health issues of our associates, review necessary countermeasures, arrange education opportunities, and engage in health promotion measures. In 2018, we once again performed a stress check in July. We are planning initiatives in the form of audience participation workshops that aim to improve mental healthcare using the diagnostic results for both individuals and organizations. The planned workshops are titled “Creating a Vibrant Workplace” geared toward the headquarters and “The Strengths and Weaknesses of My Workplace” geared toward the manufacturing facilities. In addition, we are planning anger management training as part of the Human Resources Department’s stratified education. The “Second Term Data Health Plan” formulated by Society-managed Health Insurance and submitted by the Ministry of Health, Labour and Welfare began in April 2018. We will continue the PDCA cycle taking into consideration the significance and background of future health promotion and collaborate and cooperate on developing measures for prevention, early detection and early treatment of diseases. As part of our efforts, we are promoting cancer screening for those age 40 and over and holding regular interviews and guidance presented by Occupational Health and Medical Insurance staff members with priority follow-ups on those prone to diabetes.